When you're trying to sell your products to those who work with natural and man-made fibers, it's easy to get tangled up in a knot of unreliable data. But with this textile industry mailing list, it's easy to find the sales leads you need. The textile manufacturing industry is a vital part of the fabric of our economy, and companies working within this field are always on the lookout for products or services that can help make their operations more efficient. If your business has the solution they need, reach out with this textile production email database and let them know. 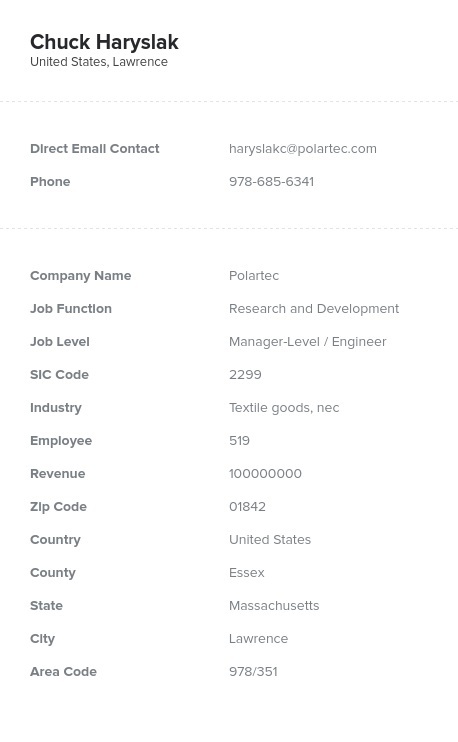 Whether you want to reach companies that work with cotton, wool, polyester, or nylon, you can find their contact information in this one consolidated, pre-built business database. Download this textile manufacturing email list and you'll find the real names, company information, phone numbers, mailing addresses, email addresses, and fax numbers of key contacts working in areas such as hosiery and underwear manufacturing, outerwear production, and mills that make carpets. Best of all, this information is all both machine-checked and human-verified to ensure that it's accurate. Bad data can leave your sales team at loose ends, but with our reliable email marketing lists, you'll be sewing up new contracts in no time! Just buy this fabric production mailing list, load the .CSV file into your CRM system, and you'll be ready to email, cold-call, or send direct mail to valuable sales leads at textile manufacturers across the country.